The dance, of course, is the continuing attempt by Congress to have NASA commit to a mission to explore Europa, and NASA’s attempts to delay a mission well into the 2020s. NASA is also seeking ideas for alternatives to the current $2B Europa Clipper concept that would cost no more than $1B but that also would presumably be less capable. 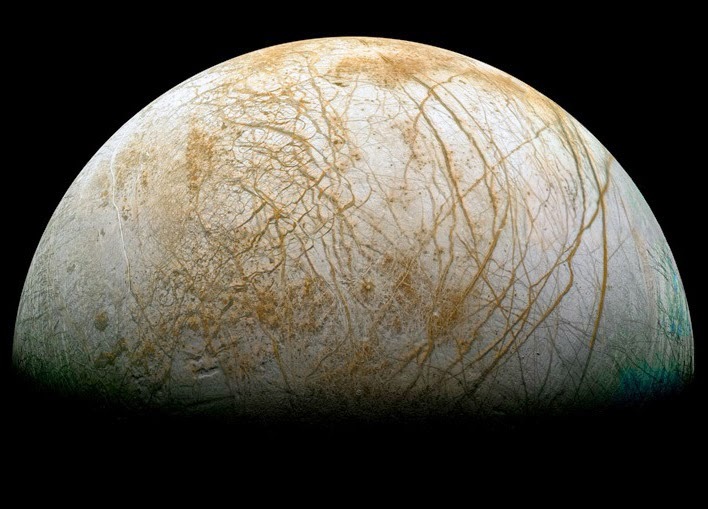 Compared to the budget waltz, the scientific case for a mission to Europa is compellingly simple. After the Earth, Europa is considered by many scientists to be the most likely location in the solar system as a home to present life. It has the key ingredients: an outer layer with lots of water (more than in the oceans of Earth) in contact with the rocky core (source of key elements needed to build the molecules essential for life) and energy (from the tidal heating supplied by Jupiter). And Europa has had a lot of time for life to evolve. Its oceans should have been present for most of the life of the solar system. (This distinguishes it from Enceladus where the weaker tidal flexing of Saturn may allow its internal ocean to freeze for long periods of time.) The recent observation of possible plumes spewing water into space where Europa’s ocean could be easily sampled has just raised the desire for a dedicated Europa mission. The Europa Clipper would replace a short-lived Europa orbiter concept with a spacecraft that would fly past the moon several dozen times with a highly capable instrument payload. At each encounter, the instruments would do low- to medium-resolution studies before and after closest encounter, but would do high resolution studies during the brief period when the spacecraft is less than 1000 km from the surface . Credit: NASA/JPL. In the 1990s and early 2000s, the Galileo orbiter made eleven of flybys past Europa. That mission all but proved the existence of a liquid ocean beneath the moon’s icy shell and globally mapped the surface features and composition. Galileo, however, had a crippled main antenna that reduced the returned data to a tiny trickle of what had been planned, so medium and high resolution mapping of the moon covers only small areas. The spacecraft’s vintage 1970’s technology instruments also lacked the sophistication to identify important substances in the icy surface. It also did not carry instruments that could probe the structure of the icy shell to look for lakes within the shell or study the shell’s interface with the ocean. The standard progression for exploring a world is first flyby it (which Galileo did), then orbit it for globally studies, and then land on it for intensive studies in a single location. Unfortunately, Europa sits well within Jupiter’s harsh radiation belts, and any affordable orbiter would have weeks to a handful of months to complete its studies and would carry a minimal instrument compliment. JPL’s engineers and scientists have developed an alternative strategy for the proposed Europa Clipper mission: Fly a highly capable spacecraft that orbits Jupiter, but that toe dips into the radiation belt and conducts its science during several dozen flybys. The radiation challenges are still significant, but the science that would have carried a cost of >$4B as an orbiter can now be done for ~$2B. The several dozen flybys is key to the Europa Clipper’s ability to replace an orbiter mission with a multiple-flyby mission. 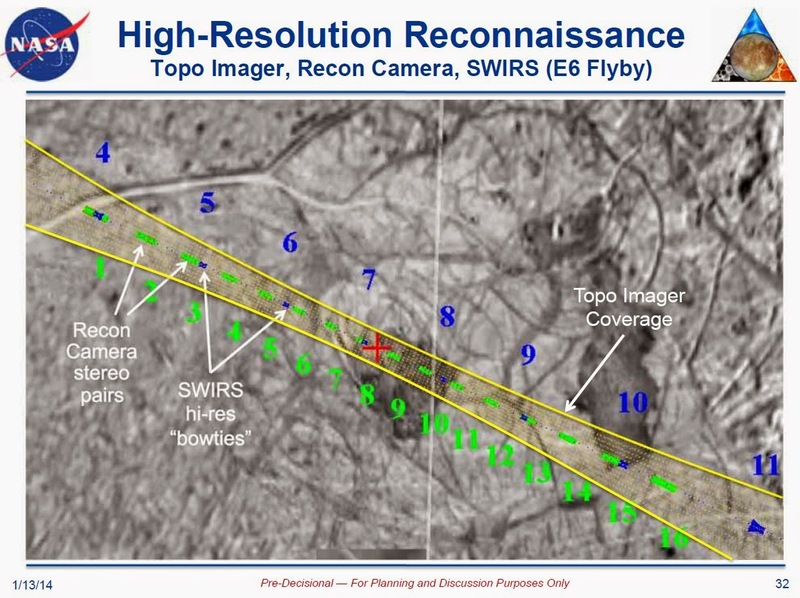 During the few minutes around closest encounter, high resolution studies are done only for a narrow swath along the ground track immediately below the spacecraft's flight. Credit: NASA/JPL. Over several dozen flybys, the high resolution measurements build up into regional studies. Credit: NASA/JPL. The combination of low, medium, and high resolution measurements add up to an understanding of Europa as a world over several dozen orbits. (Acronyms: 13F7 - name for a specific concept for a set of flybys; COT-4 - name for the final campaign (of four) for the Europa Clipper mission; SWIRS - Short-wave infrared spectrometer that would map the composition of the surface.) Credit: NASA/JPL. I’ll focus on just one set of requirements and how they link to several key investigations. 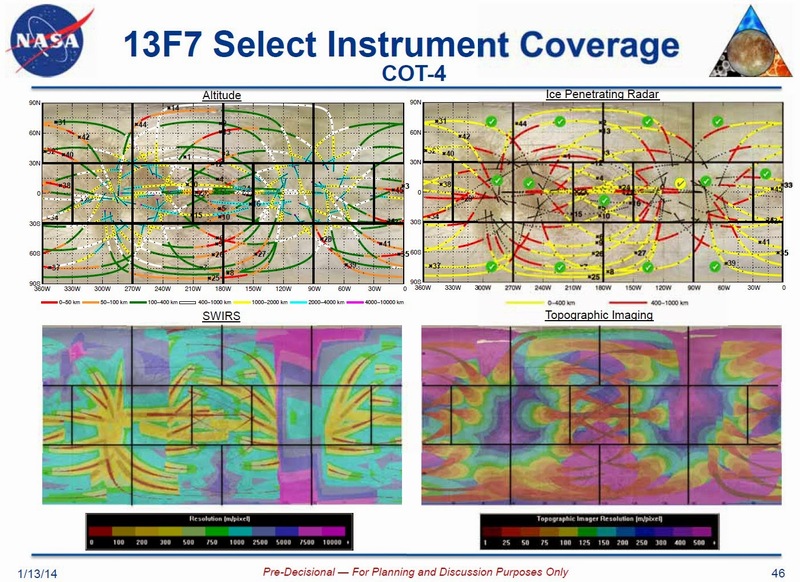 To ensure that proposed mission achieves global coverage, the science team has divided Europa’s map into 14 panels. The science goals require that the spacecraft fly over at least 8 of these panels at altitudes of less than 400 kilometers with a desired goal of 11 panels. Within each panel, the requirements specify that at least two close flybys occur in each on the Jupiter-facing hemisphere of Jupiter and three on the anti-Jupiter face. 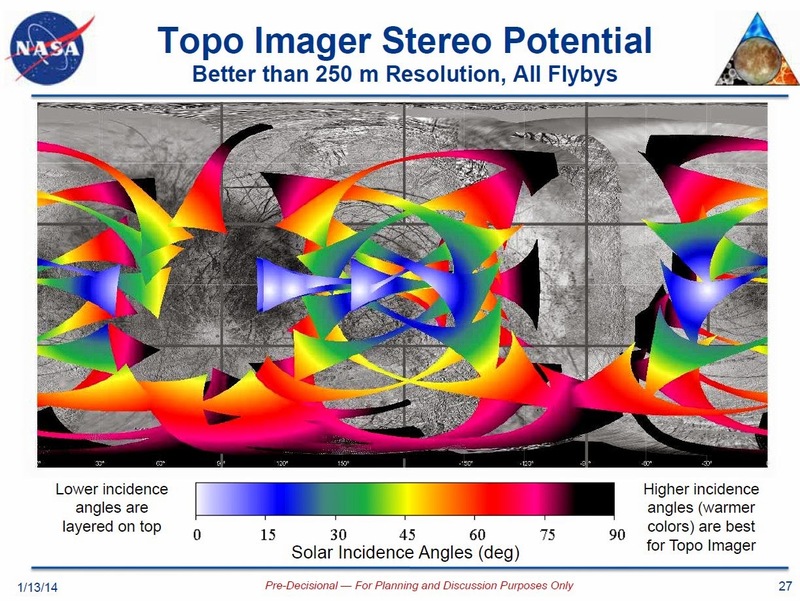 If the minimum 8 panels are evenly distributed between the pro- and anti-Jupiter hemispheres, then 20 flybys are needed to meet the minimum science goals. “Characterize the ice shell and any subsurface water, including their heterogeneity, ocean properties, and the nature of surface-ice-ocean exchange. · “Characterize the distribution of any shallow subsurface water and the structure of the icy shell. · “Search for an ice-ocean interface. · “Correlate surface features and subsurface structure to investigate processes governing material exchange among the surface, ice shell, and ocean. · “Characterize regional and global heat flow variations. “Understand the habitability of Europa's ocean through composition and chemistry. · “Characterize the chemical and compositional pathways in Europa's ocean. The science goals similarly require a number of well distributed flybys to study the interaction of Europa’s ocean with Jupiter’s intense magnetosphere to estimate the depth and salinity of the ocean and to study tides to estimate the ice shell’s thickness. The current Europa Clipper mission concept goes well beyond the minimum science goals to deliver on almost all the extended goals that the science community has set. 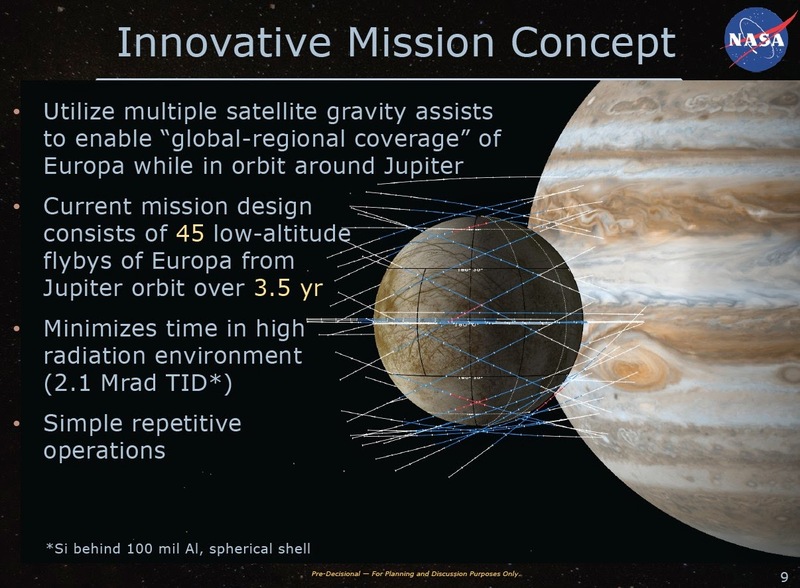 However, cutting the current mission concept from its 45 Europa flybys to a minimum of 20 or fewer flybys seems unlikely to cut the mission costs in half. Once you build and fly a spacecraft to Europa that can withstand 20 encounters, operate a suite of instruments, and return a large volume of data between encounters, I suspect that you've already incurred most of $2B cost (but remember that I am neither an engineer nor a planetary scientist). NASA managers have formally asked if a credible Europa mission could be done for half the Clipper cost estimate, or around $1B. This is a good news/bad news scenario. NASA took the initiative to propose an in-depth study by suggesting spending $15M next year ($85M less than the House of Representatives appears ready to approve for next year, see below). However, next year’s study would be followed by several years before any mission conceived would actually begin development and a decade or more before it might launch. ” Understand Europa’s space environment and interaction with the magnetosphere. It is common for government agencies to issue these “Requests for Information” to learn whether an idea is credible and worth pursuing. This request doesn’t commit NASA to any follow up studies, but if its managers judge any of the proposals to be credible, it presumably would follow through with more detailed analyses. Is a $1B mission idea credible? I did a thought experiment in a previous post and concluded that technically it likely is. The Juno spacecraft that will orbit and study Jupiter cost ~$700M. A mission to fly by Jupiter’s moon Io, deeper in Jupiter’s radiation field, six or so times has been estimated to cost ~$1B. The European’s JUICE mission will reach Jupiter next decade, flyby Europa twice, and then orbit the moon Ganymede for ~$1.2B. If the goal simply is to fly by Europa a few times with a spacecraft with a small number of instruments, then by analogy with these other Jupiter missions, it likely can be done for ~$1B. The bar, though, for a scientifically credible mission is higher. A follow-on mission has to substantially enhance our scientific understanding of Europa to justify a cost of $1B to $2B. Most of the key studies identified by the science team require numerous flybys distributed across the globe. A proposal suggests a clever way to redefine the science goals in a way that returns the core science with a simpler and cheaper spacecraft. The team that proposed the Juno mission on its way to Jupiter did this for studies of Jupiter’s deep atmosphere and interior. The current Europa Clipper multi-flyby proposal redefines the science goals from previous orbiter proposals to substantially cut costs. Is there another option that can cut costs substantially again? In a few months, we are likely to learn whether NASA received any proposals it considers worthy of further study. They key, though, will be whether the science community agrees that the mission meets the core requirements for understanding Europa. If it doesn't, then the community seems likely to recommend waiting until budgets allow the right mission to be flown. Missions to each outer planet or their moons occur only every couple of decades. Why do a sub-par job on the next mission to Europa and then have to do it over a decade or two later to get it right? In the introduction to this post, I said that NASA (and the President’s budget office that writes NASA’s budget requests) and Congress disagree on whether a Europa mission should begin now or wait to begin development several years from now. The root of the disagreement, as in so many relationships, is money. Jupiter’s harsh, electronics-frying radiation belts, make any mission that does more than a handful of flybys a technically challenging – read expensive – proposition. More than a decade’s worth of technology development and mission studies has provided the solutions to most of the technical challenges. JPL’s scientists and engineers have developed a killer proposal for a dedicated multi-flyby Europa Clipper mission. At ~$2B, this mission would be cheaper than the Curiosity rover mission currently exploring Gale crater on Mars. Unfortunately, NASA’s budget is oversubscribed. The only way to fit the Clipper mission into the budget is to either increase NASA’s budget by several hundred million dollars a year for several years (which I would support as a US taxpayer!) or take the funding from other NASA programs. We are left with this strange waltz in which Congress, which ultimately sets NASA’s budget, has not increased the overall budget enough to fully fund the Clipper mission, but over the last two years provided $150M for advanced development work. This year, the House of Representatives is proposing to put another $100M in the pot for next year. If the Senate continues its previous support, it is likely to substantially match this funding. At the other side of the dance floor, the President’s budget managers and NASA’s managers have made it clear that they don’t want to commit to any Europa mission this decade because of the funding constraints. They also seem reluctant to commit to any $2B-class science mission because the last two large science missions (the James Webb Space Telescope and the Curiosity rover) went well over budget, which caused substantial harm to the overall science program. As a result, today NASA is spending $150M because it’s legally required to (Federal budgets in the US are laws) to advance a mission its senior managers don’t want to do, at least for this decade. The House of Representatives has released details of its proposed budget for next year. Where NASA proposed to spend $15M to study $1B mission concepts, the House is proposing to spend $100M. Under the House’s bill none of the funding could go towards a $1B mission (which it doesn't see as credible) but only towards the full Europa Clipper mission. We will have to wait for several weeks to see what the Senate proposes. It will be several months before we learn what the two houses of Congress ultimately compromise on for next year. The US House of Representatives has just released the details of its draft proposed NASA budget for Fiscal Year 2015 (starting October 1 of this year). For planetary science it is good news all around. In fact, it’s great news because the proposed spending bill micro-manages NASA’s budget to bring NASA’s planetary program closer to the plan laid out in the scientific community’s Decadal Report outlining goals for the coming decade. While it is easy to become cynical about politics, it is clear that in this case the politicians and their staffs from both parties on the subcommittee that wrote this draft budget are familiar with the details of the planetary program and are following the scientific community’s lead. Instead of giving unfunded mandates, all the changes they request are accompanied by proposed increases above the President’s budget proposal. In this post, I’ll let the House subcommittee speak for itself through key quotes from the proposed budget bill (starting on page 67). For the larger context of the budget in Washington’s politics, I encourage you to read Casey Drier’s post at the Planetary Society blog. - The budget provides the funds to continue operating all NASA missions that are currently operating. The President’s proposed budget did not have funds for either the Mars Opportunity rover or the Lunar Reconnaissance Orbiter. Money is also provided to continue the Cassini mission at Saturn, which was also included in the President’s budget request. – This is a modest $8M increase over the President’s budget. The key requirement is that the rover must meet the requirements laid out in the Decadal Survey, which means that that it must be capable of selecting and caching samples for a possible return to Earth for studies in terrestrial laboratories. This has been NASA’s plan, but the final payload – the ultimate expression of the mission’s goals – hasn’t been announced, and this is the House’s way of ensuring that NASA follows through. - Selecting Discovery missions every two years instead of every five would significantly enhance the number of planetary missions NASA flies. The bill adds $30M to the Discovery budget to accelerate the rate at which missions are flown. This will be big news if the Senate follows suite and this is part of the final budget law. - The House subcommittee that wrote this budget language continues to strongly support a highly capable mission to Europa. NASA has formally requested proposals for a mission that would cost half as much as the proposed $2B Europa Clipper mission, but that likely would do much less science that specified in the Decadal Survey. It will be interesting to see if the Senate includes similar language in its version of NASA’s budget. If this language survives into the final budget, this will be a strong directive to NASA to plan for a highly capable Europa mission. - The House subcommittee really likes Europa. A mission to land on Europa would have to follow the Europa Clipper mission that would scout possible landings sites. This is an investment in technology for a mission that isn’t likely to fly until the 2030s.